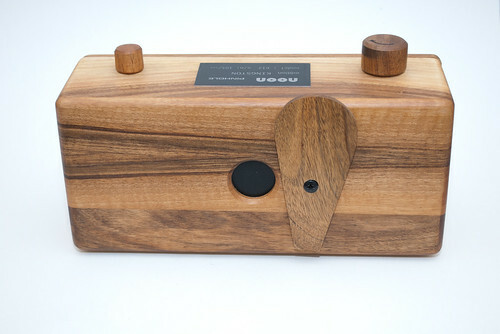 The Noon Panoramic Pinhole Camera is a piece of modern woodwork artistry: A rollfilm camera consisting of 99% fine wood. It's a pinhole camera with a round "60mm" pinhole. Aperture is varying, for example f207 or f222, as is the pinhole size: 0.27mm or 0.29mm. The dark chamber's size can be reduced to smaller size if normal type No. 120 film formats 6x6cm or 9x6cm shall be achieved instead of 6x12cm panorama format. The camera back has one red window for each possible format. 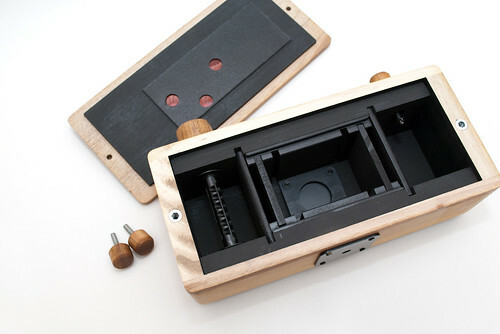 The camera of the brand Noon was designed by Jacek Urbanik.